XRP reversed the bigger part of Wednesday’s gains. The local support is created by 50-SMA (1-hour). XRP is changing hands at $0.4403 at the time of writing, after a strong rally on Wednesday that took it to $0.4600 in a matter of minutes. The third largest coin with the market value over $17.4B registered an average daily volume has settled at $317M. Ripple has gained 3% on a daily basis and lost 1% since the beginning of Thursday, which confirms the suggestion that the spike was a one-off event, triggered by some large transaction. Ripple attracts celebrities to its project as if trying to chase away investors’ worries about legal issues. Bill Clinton, the 42nd president of the United States, will speak at the conference in October, while Madona is going to help them raise funds for Malawi children. These developments may be beneficial for Ripple’s reputation, but they do not qualify as a strong market catalyst. 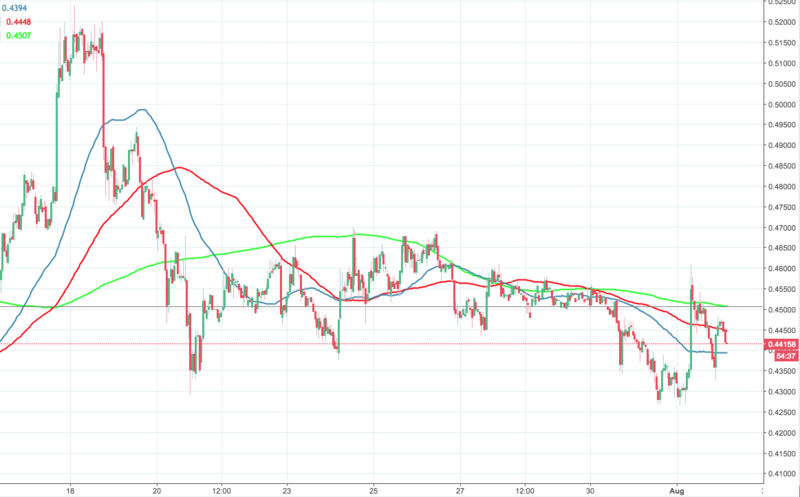 From the technical point of view, XRP/USD is moving towards 50-SMA (1-hour chart) at $0.4394. If this support is cleared, the downside may be extended to Wednesday’s low at $0.4265. On the upside, $0.4500 is the main hurdle, followed by strong resistance at $0.4600.